Suffering from e-mail overload? Google introduced a new weapon called Smart Labels for Gmail users Wednesday that automatically redirects Bulk, Notifications, and Forums e-mail so that the messages never hit your inbox. Instead, they are delivered to their respective folders (see image at right). The idea, Google says, is to separate personal e-mail from things such as bulk e-mail promotions and Facebook update notifications that can litter your inbox. To activate the Gmail Smart Labels feature, open the Labs tab in Settings by clicking the green icon in the top right corner, and scroll down to Smart Labels. While the addition is a nice tool to combat e-mail fatigue, the feature may filter your inbox to death. In other words, if you categorize group mailings like newsletters with store promotions and more important notifications like credit card statements, will you ever read them? And more important, do people actually filter their incoming e-mails anyway? "Gmail's filters and labels were invented to help manage the deluge, but while I have about 100 filters that triage and label my incoming mail, most of my friends and family have all their messages in a giant unfiltered inbox," Chen explains on Google's blog. You can customize Gmail Smart Labels so e-mail is delivered to the right folder. The Smart Labels feature is an experimental categorization tool that complements Google's 'Priority Inbox' and will help those who want the sorting and filing done for them. The good news is that the categorization can be customized and will combat some of the issues Gmail had with its default filtering rules when it rolled out its one-size-fits-all Priority Inbox last August. 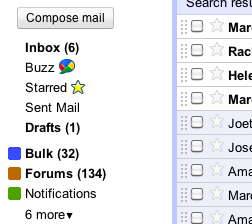 However the big question is, will users actually open incoming e-mails once they're sorted into folders? Smart Labels may be a solution for those who like to remove the clutter within their Gmail inbox, but it may not be enough to combat e-mail fatigue, especially if you have to search through folders to find that one message that was improperly sorted.